The Young Lions must’ve looked great on paper. 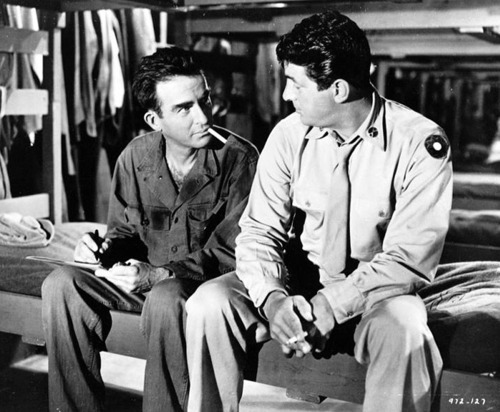 Marlon Brando, Montgomery Clift and Dean Martin; three hot actors, three juicy WWII rolls, all in the vein of From Here to Eternity, which boasted Burt Lancaster, Monty Clift and Frank Sinatra and was a mega-box office smash only four years earlier. The Irwin Shaw novel that the Edward Dmytryk directed film would be based on was a New York Times bestseller. In fact, the novel would be continually compared, favorably, to James Jones’ From Here to Eternity on “Best of” World War fiction lists for the rest of the 20th century. The Washington Post declared Lions as one of the four greatest war novels. So why was the film such a muddled affair? For one, Brando was taking increasingly stranger roles after his biggest hit to date; 1954’s On the Waterfront. He followed that masterpiece by playing Napoleon Bonaparte in the epically weak Désirée , moving onto the singing/dancing role of Sky Masterson in Guys and Dolls, and then playing the racially insensitive role of Sakini in the abysmal The Teahouse of the August Moon. Brando was the physical embodiment of the industry’s identity crisis in the 50s, bouncing from dreadfully boring epics (Julius Caesar, anyone?) to exploitation (The Wild One ) to musicals to distasteful “racial” comedies. So when The Young Lions came along, the hope was that he was finally moving back to quality material. He was, again however, adopting another foreign accent (this time a Bavarian Nazi) when there’s nary an argument to be made that the Method Actor’s weakest gifts was his inability to adopt any accent beyond a Brooklyn boy of the streets. But Brando was one of the biggest box-office draws, and it was decided to give him the “lion’s share”(pun intended) of material in the film, compared to his costars Montgomery Clift and Dean Martin. Clift was currently in the slow-death spiral that earmarked the last decade of his work, following the infamous car accident that changed his features and played havoc with his psyche. 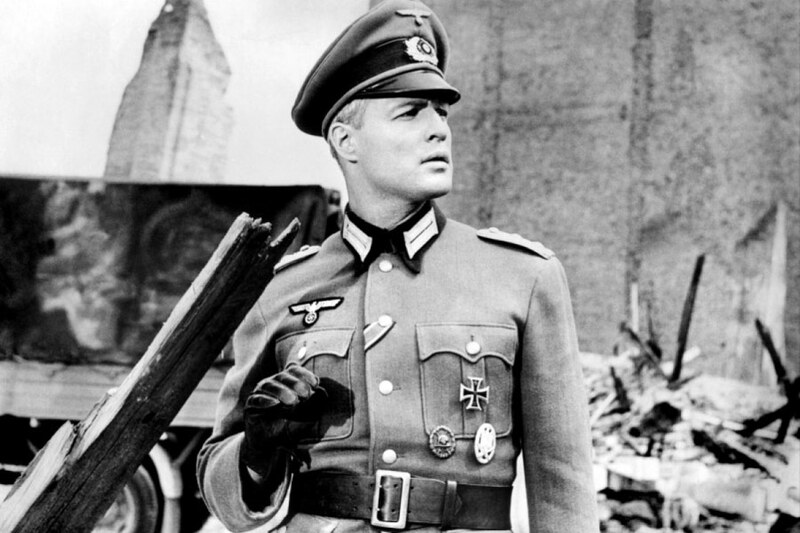 Looking easily 15 years older than he was, the idea that Clift’s character Noah Ackerman, was a young, shy, inexperienced private, a typical part for him pre-car crash, no longer seemed feasible. Much like his character in From Here to Eternity, Clift’s Ackerman is an outsider, who finds himself at odds with his bootcamp platoon. 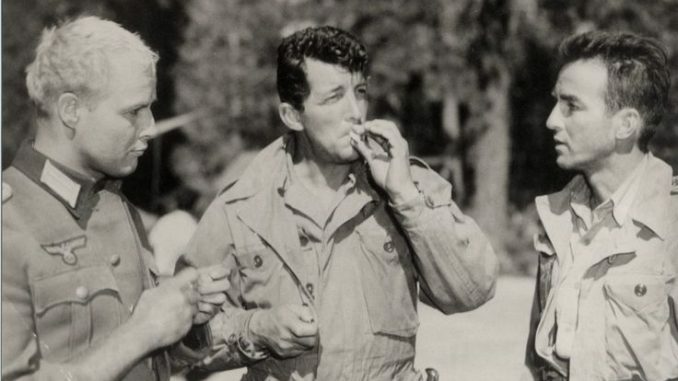 Night after night he has to fight four different barracks bullies, while “coward” Dean Martin stands on the sidelines. Clift finds salvation in the arms of the equally inexperienced and saintly “good girl,” Hope Lange. Again, much like Eternity, Clift becomes obsessed with his “girl,” going AWOL just to see her. As good as Clift is, and he was always good, Clift’s story plays as an almost identical retread of his earlier success. Then there’s Dean Martin. Today, he’s remembered as the fun-loving crooner, once second banana to his comedy partner Jerry Lewis. But the late 50s were a tough time for Martin. His split with his partner was then considered career suicide. Between Martin and Lewis, it was Martin who had the most to prove, since Lewis made a smooth and natural transition to comedy success, while Martin was the ubiquitous straight man trying to forge an identity. His first foray alone was the excruciating farce, Ten Thousand Bedrooms, a flop. The Young Lions was his second solo attempt, and Martin was forcing his wings to stretch even further, taking on a serious role. As Nightclub performer/Broadway Producer Michael Whitacre, Martin’s thinly “disguised” alter-ego confused audiences. The character looked, sang and acted like the familiar crooner. But instead of Martin being hipster cool Dino, he was a coward, doing whatever he could to avoid the draft, to the chagrin of his girlfriend, Barbara Rush. He’s able to worm his way out of serving in the front lines, by doing Goodwill Ambassador work in Special Services. 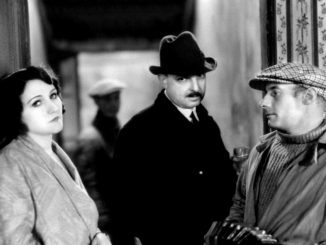 The three men’s stories, clearly defined and reflecting well off each other in the book, are haphazard and murky in the film. Part of this has to do with the dramatic shift taken with Brando’s character. In the book, Lt. Christian Diestl is a young and idealistic ski instructor prior to the war. But as the horrors of his position in the SS becomes more apparent, his softness fades and he turns into a horrible sadist. The producers knew this would not do for Brando, so for the film version, his arc is rewritten to pivot 180 degrees in the other direction. He still starts out idealistic; hoping the Nazis will bring strength and direction to his beloved but depressed and financially strapped Germany. But his determination to be a good soldier is counter to the orders being given, executing women and children, and secreting the spoils of war (which includes other men’s “women”) for a few “chosen” military brass. Like many of Brando’s characters, he’s trapped in an existential crisis, only deciding in the third act to reject the tenets of Fascism. The greatest buzzkill of The Young Lions, however, is the unrealized opportunity to experience the two great Method Actors, Brando and Clift, together. Clift’s Ackerman and Brando’s Diestl never appear together onscreen, except in the finale, and even then, they’re never even in the same frame. Is The Young Lions worth seeing? If you’re a classic film fan, then of course. Twilight Time’s recent Blu-ray transfer is impeccable, and even though the audio levels are somewhat erratic, it’s still a major improvement over earlier reissues. Yes, the film is slow, the tension erratic and the overall filmmakers intentions; somewhat suspect. 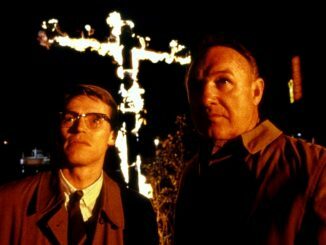 But in the final evaluation, The Young Lions is a painful delicacy; offering so much potential, a few passing moments of attainable pleasure, and ultimately, a great opportunity to experience a fine representation of this time in Hollywood and a pivotal moment for these three immortal icons. The Young Lions is available as a limited edition blu-ray through Twilight Time.